The poorest people in the UK are more than twice as likely to have diabetes at any age than the average person, a charity has warned. And those with the condition who live in the most deprived homes are also twice as likely to develop complications, Diabetes UK said. 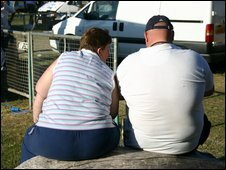 Obesity, lack of exercise, poor diet and smoking are to blame, it added. One public health expert said efforts to prevent and treat the disease should be targeted at the most vulnerable. As of 2008, there were 2.5 million people diagnosed with diabetes in the UK. Numbers have been climbing in recent years due to increased efforts to find people who were unaware they had the condition. It has been predicted that by 2025, there will be more than four million people with diabetes in the UK. The most common type is type 2 diabetes, which is generally associated with lifestyle factors, such as being overweight. It is caused by the body not producing enough insulin or when the insulin that is produced does not work properly. If not managed effectively it can lead to complications such as heart disease, stroke, kidney failure, blindness and amputation. The report also found that women in England who live in homes with the lowest income are more than four times as likely to get diabetes as those who live in homes with the highest income. And diabetes in Wales is almost twice as high in the most deprived areas compared to the least deprived. Douglas Smallwood, Diabetes UK chief executive, said action is needed to prevent a generation of people living in deprivation "ending up in an early grave". He said health authorities needed to raise awareness among those at high risk. "In addition, the NHS must ensure that appropriate, high quality care is available across the country and that everyone, regardless of their socioeconomic status, is accessing it. "Research has shown that people with diabetes in deprived or high ethnicity areas are less likely to have key health checks, putting them at increased risk of developing devastating complications such as heart disease, stroke, kidney failure, blindness and amputation. "Finally, in these times of economic uncertainty when people are more likely to turn to cheaper, processed foods, food labelling must be clear and consistent to allow people to make informed choices about what they are eating." Professor Alan Maryon-Davis, president of the UK Faculty of Public Health, said the figures were not surprising as the risk factors for diabetes were very closely associated with deprivation and hard to tackle. "We do need to target efforts at the most vulnerable." He added that the national vascular screening programme which started in April and is still gearing up would help diagnose people and help them manage the illness. "But we need to set up a proper call and recall system, we can't just wait for people to go to the GP, it has to be done in a more active way."